Delicately caramelized pastry dough edges give way to a delectable soft sugar bite. Cottage cheese and butter surprises this dough into a simple, spreadable wonder. I suddenly became lightly nostalgic of Mom's Christmas decorative settings. as I roll buttery sugar pastry at mine. The bakery is open for business and holiday goodies are on their way. all the sugar and butter? Not me. Every morsel or shall I say mouthful...was pure delight. This pastry was somewhat influenced from a Central Asian butter-cheese cookie. It was apparently originated in Turkmenistan where their talents for sweets were highly appreciated. Putting my unique technique twist on it made them even more delectable.
. 4.5 oz (125g) strained cottage cheese, room temp. 1. In a food processor, place together the flour, baking powder and salt. 2. While the processor is on the pulse action, add the butter until crumbs are formed. Afterwards, add the cottage cheese and vanilla together. Whirl the ingredients on MEDIUM speed until the dough starts to detach from the sides. Plastic wrap the dough for a minimum of 1 hour or overnight. 3. 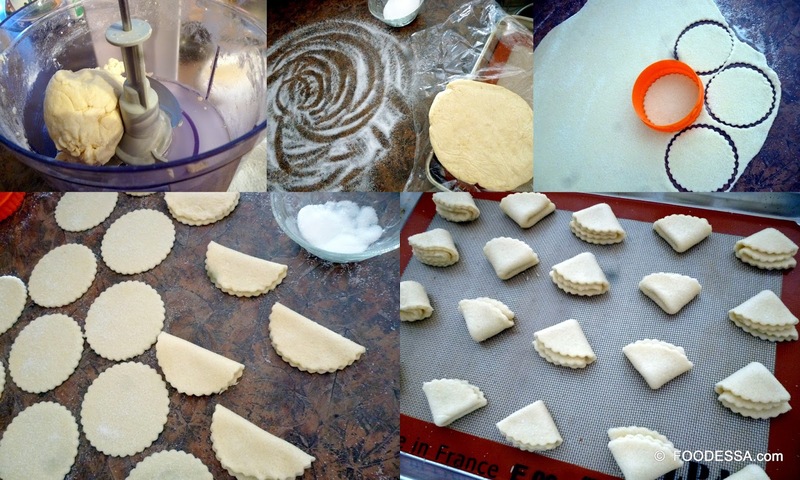 Before rolling out the dough, remove it from the refrigerator for 15 minutes before rolling. 4. Prepare a parchment or 'Silpat' on a baking pan. Pre-heat the oven to 350F/180C/Gas4. Position the rack in the center of the oven. 5. Spread a small quantity of sugar on the rolling surface. Sprinkle some more sugar onto the dough's surface and roll it out to a thickness of 1/4 inch (5mm). Note: be sure to keep spreading a little sugar over each side of the dough as you flip over and continue to roll out the dough. 6. With a 3 inch (7.5cm) decorative (ribbed) cookie cut-out, make 20 circles. 7. Gently fold each circle in half and then in half again to form a type of triangular shape. 8. Place the 20 pastries (4x5 rows) onto the pan. Suggestion (optional): it's best to refrigerate the pan for 30 minutes before baking. 9. BAKE them for 30 minutes or until the golden caramel edges appear. Before transferring them onto a cooling rack, leave them on the pan to have the caramelized bases harden for 10 more minutes. 10. Store in an airtight container for 2 weeks or freeze for up to 3 months. Enjoy. How I do love this time of year. Mom decorates and I bake my little holiday heart out...what a team. Here's to loving and sharing our creativity in our homes as well as our tummies this holiday season.